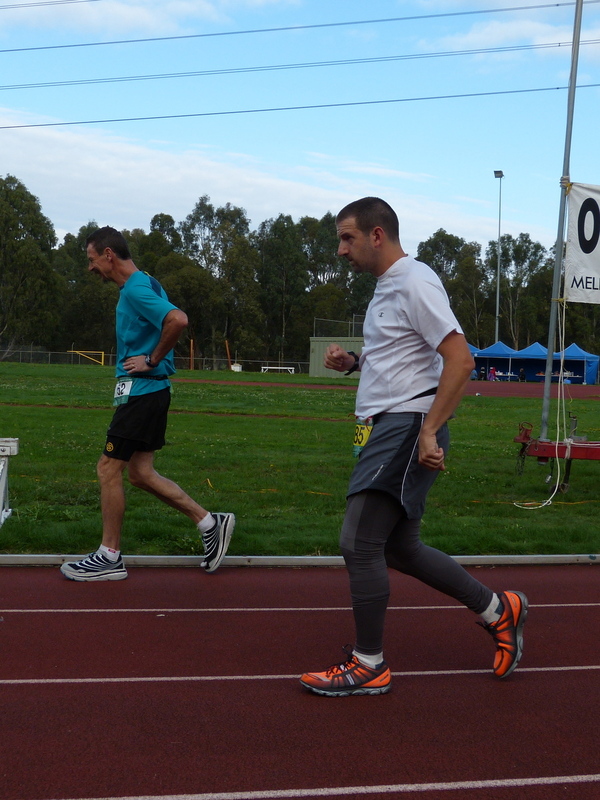 The Coburg 24-hour walk championships were held at Harold Stevens reserve, hosted and put on by the Coburg Harriers club from 10 am Saturday April 13 to 10 am Sunday 14. I competed in the men’s walk race. The field was smaller than previous year because the event is no longer the official Australian Centurions qualifying event due to a bigger running field for the AURA 24-hour championships. Nonetheless there was still a separate event held for walkers, which is nice rather than being tolerated at best in a running event. Walkers use lane 3 for racing and the runners lane 1. Lap distances are adjusted accordingly. My training in the lead up to this race was good and left me feeling more optimistic than I’d expected to be. Combined with my good result in the 6-hour race a month earlier, I felt confident that I could complete the 24-hours, increase my PB and maybe take third place based on the field. Of course, like many who enter these races I also harboured the faint dream of walking 100 miles in 24 hours (a “Centurion walk”), but realised everything would have to go astonishingly well for that to happen. It is a goal of mine, but realistically I need a lot more experience in long race to build up to that kind of distance. I have always suffered shin pain in the opening laps of races. After some advice from Michelle Thompson after the 6-hour race I worked on stretching and strengthening them and it really helped. This time I was pain-free from the start so was able to lap briskly from the very start rather than having a slow warm up hour. Ironically in the long run, this may have allowed me to go out too quickly and cost me later in the race. But I went out right on the pace I had planned for: 37 laps in the first two hours and 43km in the first six hours. I actually equaled my 6-hour PB during the race. I also equaled my 12-hour PB of 78km, but that was about 6km below where I needed to be for 100 mile pace. From the 12-hour mark on, 100 miles ceased to be a possibility for this race. From 12 hours onward it was a matter of raising my PB (128.8 km) and also racing for third place. This was in some ways a relief as it meant I didn’t have the same pressure to keep going so quickly. My right knee became increasingly sore from about 8 hours in. By 12 hours it was slowing me down. Also my calves and hamstrings were really tightening up, so much so that I stopped for a massage, costing me a 20-minute lap. During my time off the track Doug McKay passed me to move into 3rd position, he was moving well for a long time and charging a bit. Refreshed after the massage I was able to quickly make amends and retake 3rd spot. Then the leader and favourite Terry O’Neill dropped out so I was in 2nd spot! I felt bad, briefly, that his misfortune energized me, but it was a pick-me-up in the chilly late night darkness. Before long I realised that I wasn’t the only one reinvigorated by this development. John Timms, who had been a long way behind in 5th place began a sustained, relentless charge. He reeled in McKay who was done. I quickly realised that I was next in his sights! I had to fight all the way to the final hour of the race to hold him off. He was relentless, stubbornly pressing hard taking a sneaky lap off my lead here and there every couple of hours. To make matters worse my knee was extremely painful from about 14 hours on. I t was a real effort to keep even a normal street walking action, but I did. Frustratingly I didn’t feel too tired physically. Every few laps I had to put in a little “sprint” just to keep Timms at bay. In fact, my fastest lap of the race, 3:07, came as part of a fast spell just before 15 hours. As hard as Timms made it for me, he probably helped push me to a better total. He also motivated me: I was so angry! I was cursing (silently) him, my knee, and many other things besides. The anger and competitive spirit helped me. It also kept things interesting. My main strategy became sitting just a couple of meters behind him on the track, surging when he surged and slowing as he did. All I needed to do was keep him there and 2nd was mine. Easier said than done, though. As my knee became worse, I had to concede a few more laps calculating how many I could let him have before he got too close. I knew that if I stopped that Timms would pass me, same if I slowed down. Eventually he ran out of hours so I just had to make sure he didn’t get more than an lap an hour on me. Finally, just before 23 hours he gave up and said he was going to stop until the last ten minutes. I put in two more laps, for safety, before also resting until I saw him go out again. I was glad for those extra laps! For he went back out at 23:30 and tried again, just on the off-chance. However, all was well and we ended up finishing side by side, conveniently sitting at my table. Steve Jordan won the race with 148.5km. I really thought he’d get his 100 miles in this one, but it wan’t his day. He still walked strongly and won, so congratulations to him. Michelle Thompson was the standout walker of the race, winning the women’s race with an Australian record distance of 184.72 km. Huge congratulations to her, what a great walk. In the men’s race John Timms finished with 136.5 km. 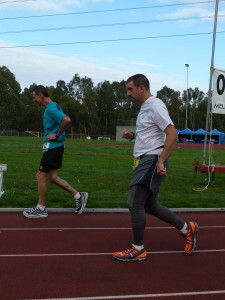 I had taken 2nd place and raised my PB by 11km with a total of 139.028 km. I was happy with that. It is a good physical and mental preparation for hopefully bigger totals to come.